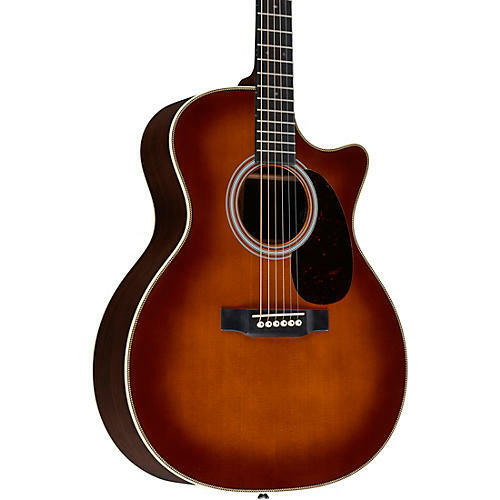 The 2018 Martin GPC28E Grand Performance Cutaway Acoustic Electric guitar has been refined to combine some of the most desirable vintage appointments with modern playability. The Grand Performance body design is famous for having a very clean, precise high-end tone, along with a perfectly balanced bass response. The GP body is deeper than the traditional Martin Auditorium (000) for good reason. The deeper body allows the sound a little extra time to build before it jumps out of the soundhole. The result is a well-balanced sound that is crisp and clean with a lot of punch on the low end. Standard models, like this GPC28E Grand Performance, come with a very fast, playable solid neck; featuring a Modified Low Oval shape, with High Performance neck taper and 1-3/4" nut. The combination of the "vintage" tone and modern playability creates an instrument that you won't want to put down. Martin has refined their 2018 Standard lineup to include some of the most desirable vintage appointments. The 2018 lineup features, aging toner, Antique White binding, vintage-style fingerboard inlays, vintage open-gear tuners, and vintage-era bracing for that unique "Golden Era" tone.